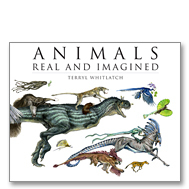 Animals Real and Imagined: A fantastic visual voyage into the world of animals, both real and imagined. 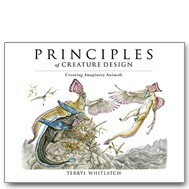 There is no end to the diverse and unique creatures that Terryl Whitlatch creates for us with her solid knowledge of anatomy and boundless imagination. Especially intriguing are the 100s of anatomical notes that are dispersed among her sketches, educating and enlightening us to the foundation of living bodies and their mechanics. 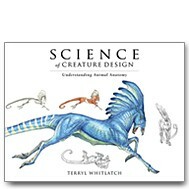 Terryl Whitlatch is an accomplished, scientific, and academically trained illustrator who extensively studied vertebrate zoology and animal anatomy. She has worked for various zoos and museums in the US and The World Wildlife Fund as Senior consultant for Wildlife Art and Animal Anatomy. She is considered to be one of the top creature designers and animal anatomists working in the field today. In a career spanning over 25 years, Terryl has many projects to her credit, including Star Wards: The Phantom Menace, Star Wars: The Special Edition, Jumanji 1 and 2, Men in Black, Brother Bear, Dragonheart, Alvin and the Chipmunks, Curious George, The Polar Express, and Beowulf. For over seven years, Terryl worked for Lucasfilm Ltd., Industrial Light & Magic and George Lucas’ JAK Films. Her unique combination of illustration skills are comprehensive knowledge of animal anatomy and movement are essential components in the design, anatomy and physical animations aspects of believable creature creation. Categories: Books, creatures & characters. Tag: terryl whitlatch.